If you're completely new to drumming or a well-seasoned player that wishes to make a return to your passion the Roland TD-1DMK V-Drums Electronic Drum Kit has exactly what you need. Everything from the easy to use sound module to the incredibly realistic mesh heads emanate that "wow-factor" that have made Roland V-Drums the worlds most popular brand. There's never been a better time to unleash your inner drummer. Before we mention the staggering sound quality of the Roland TD-1DMK we should address the build quality and the incredible realism that this portable kit brings to the table. As always, you can expect a rock-solid frame that is very easy to set-up and position to your needs. No matter what your age or height, the TD-1DMK's frame can be adjusted to suit your needs. Once you have your frame in situ you can begin mounting the double-mesh head drums. A dual-zone 8" snare head is capable of capturing everything from subtle rolls through to immense powerstrokes, perfectly delivering your expression to the sound module. The 6" double mesh-head toms provide an equally excellent response so you can practice your dynamics and dexterity to your heart's content. The Roland TD-1DMK pays equally good attention to the crash, ride and hi-hat cymbals. Whether you want to perform intricate hat grooves along to your beat, expressive cymbal swells, gentle ride or huge metal crashes the TD-1DMK gives you the freedom to perform how you want to. The TD-1DMK comes with the popular TD-1 sound module that boasts 15 top quality drum kits that cover many different styles. Rock, jazz, blues, funk, electronic - it's all here and it's all premium quality. Aside from the ample capabilities of the internal sounds, you can also use the USB transmitter to play the drums from your favourite virtual instruments or trigger other USB MIDI equipment making the TD-1DMK infinitely expandable. New player? Got you covered! For new learners young and old, the Roland TD-1DMK comes complete with a wealth of enjoyable functions to encourage learning. Packed with tutorial features that develop technique, boost motivation, and help you get the most out of practice time. The onboard metronome is there to tighten up your timing, and use Coach mode to build speed, stamina, and accuracy. You also get a collection of internal songs to play along with, but should you want to play along with your favourite songs, simply connect your MP3 player or smartphone to the TD-1K via the built-in jack plug. 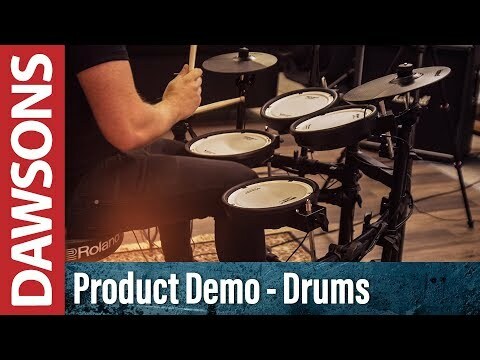 The Roland TD-1DMK V-Drums Electronic Drum Kit sets a new standard in electronic drumming and Roland have also included 40 free drum lessons from Melodics too! So beginner or pro, this is the kit that will work with you for years to come. Weight 17.8Kg / 39 lbs. 4 oz.